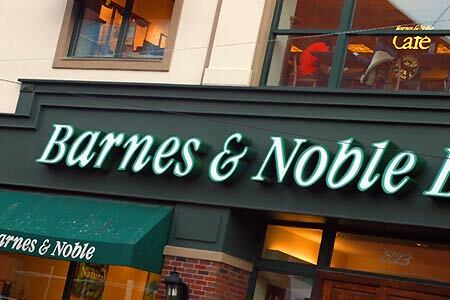 In filings with the SEC yesterday, Barnes & Noble said that it is restating earnings for the fiscal years 2010, 2011 and 2012. On one level, the effect was positive: in the first two years, B&N said it had overstated losses by $9 million, and in 2012 it earned $43 million instead of $37 million, according to Crain's New York Business. Still, Wall Street apparently didn't approve of the underlying problem, and yesterday B&N shares closed at $17.56, down 5%. The bookseller blamed "inadequate controls over the accrual reconciliation process at its distribution centers," which Crain's said "seem to stem from the company's decision to buy more books directly from publishers instead of wholesalers." Anthony Catanach, a professor at Villanova University's School of Business, told Crain's that apparently investments in accounting systems did not keep pace with new infrastructure, saying, "When you ramp up distribution centers like Barnes & Noble did it really puts pressure on internal control systems, in my experience." In other news, B&N said that William Lynch, who "resigned" as B&N CEO on July 8, received cash severance of $3.65 million and full vesting on 275,846 restricted shares of stock worth $4.871 million on the day of his departure. The New York Times outlined an effective publicity tactic: have an author appear on Fox News for a hostile interview. Last Friday, Reza Aslan, author of Jesus: The Life and Times of Jesus of Nazareth (Random House), appeared on Spirited Debate, where host Lauren Green challenged him on a variety of levels: "You're a Muslim, so why did you write a book about the founder of Christianity?" Aslan responded: "I am a scholar of religions with four degrees, including one in the New Testament, and fluency in biblical Greek, who has been studying the origins of Christianity for two decades, who also just happens to be a Muslim." Buzzfeed posted a 10-minute clip of the interview with the title "Is This the Most Embarrrassing Interview Fox News Has Ever Done?" The clip went viral, and sales, according to Random House, rose 35%, leading it to order another printing of 50,000 yesterday. Karen West of Book Passage, Corte Madera and San Francisco, Calif., told the paper that the interview helped expand the book's audience: "It's moved now out of the NPR realm and it's gotten into the broader culture." Aslan told the Times, "I'll be perfectly honest--I'm thrilled at the response that people have had to the interview. You can't buy this kind of publicity." President Obama's visit today to an Amazon warehouse in Chattanooga, Tenn., where he will give a speech that the White House said will focus on "manufacturing and high wage jobs for durable economic growth," has evoked a strong, negative reaction from many independent booksellers. Some of them have written to the White House, and the American Booksellers Association and several regional booksellers associations expressed their reasons for concern. On behalf of the American Booksellers Association, we are writing today to call your attention to how Amazon's business practices are actually harming small businesses and the American economy. While Amazon may make news by touting the creation of some 7,000 new warehouse jobs (many of which are seasonal), what is woefully underreported is the number of jobs its practices have cost the economy. As you've noted so often, small businesses are the engines of the economy. When a small business fails and closes its doors, this has a ripple effect at both a local and a national level. Jobs are lost, workers lose healthcare and seek unemployment insurance, and purchasing decreases. And while Amazon may now be boasting about the creation of jobs, any gains are elusive, and not a long-term solution. The simple fact is that Amazon's practices are detrimental to the nation's economy. The news this weekend that Amazon is slashing prices far below cost on numerous book titles is further evidence that it will stop at nothing to garner market share at the expense of small businesses that cannot afford to sell inventory below their cost of acquisition. In the end, monopolies are bad for consumers--and there are no examples in American history that prove otherwise. In addition, Amazon's continued practice of using books, both in print and e-book formats, as "loss leaders" in an effort to increase their already immense market share of the retail book trade and to up-sell large-ticket items has impacted Main Street retailers and the communities in which these stores are located in ways that can be calculated (job losses, store closures, a decrease in sales tax revenue, etc.) and in ways that simply cannot (urban blight, budget cuts affecting first responders and other community services, etc.). All told, according to the Institute for Local Self-Reliance, every $10 million in spending that shifts from Main Street retailers to Amazon results in a net loss of 33 retail jobs. That would mean for 2012 alone--using Amazon's own numbers about its increase in sales--Amazon cost the U.S. economy almost 42,000 jobs just last year! At a time when Main Street retailers, including indie bookstores, show promise of recovering from the recession, we are disheartened to see Amazon touted as a "jobs creator" and its warehouse facility used as a backdrop for an important jobs speech, when, frankly, the exact opposite is true. Conversely, the value of a local business to its community cannot be overstated--whether through job creation or in the myriad ways it gives back to the community. We would love to continue this timely and important conversation with you. We'll bring together a group of real job creators to meet at your favorite local, independent bookstore! And we'll buy the coffee! The news that you are planning to speak tomorrow at the Amazon warehouse in Chattanooga, Tenn., as part of your campaign to highlight the need to bolster middle class families and create jobs has hit members of the New England independent bookselling community like a ton of bricks. What is the thinking behind this decision? Amazon is the very embodiment of so much that is wrong with our economy. The often-substandard working conditions at their warehouses around the world have been well documented. Their business model is based on fighting those states that have required them to collect and remit sales tax while driving Main Street brick and mortar stores out of business through predatory pricing. As we write, they are slashing prices of bestselling books in yet another price war where independent and brick and mortar businesses will be collateral damage. We cannot believe this is your vision of job creation and the future of American middle class. This, from a president who has expressed pleasure in shopping at Kramer Books in D.C., and Bunch of Grapes on Martha's Vineyard? We would hope that your administration would be standing with Main Street, and investigating the monopolistic practices of Amazon, rather than either explicitly or tacitly endorsing those practices. In the words of John Mutter, editor-in-chief of Shelf Awareness, "This is roughly equivalent of going to a Wal-Mart and calling for more of the kinds of jobs it offers." We urge you to rethink using Amazon as a beacon of hope for the American economy and middle-class. Nothing could be further from the truth. I'm writing you on behalf of the members of the Northern California Independent Booksellers Association to express our dismay at your decision to deliver an address on jobs at an Amazon warehouse. Amazon is a company that for more than decade fought tooth-and-nail to protect a business model based on sales tax avoidance, in the process fueling other online companies to copy to its actions and costing states cumulatively billions of dollars. Worse yet, in our state, Amazon's CEO purposely misled the media and public officials by stating that his company shouldn't have to pay sales tax in California because Amazon didn't have a presence here and therefore wasn't using services that sales tax covers. The fact is, of course, sales tax is collected by retailers on behalf of purchasers who are liable for it--Amazon wasn't being asked to pay sales tax, only to do what other retailers are required to do legally in the states. Amazon now has largely abandoned its sales tax avoidance strategy because it believes it needs to compete on delivery time. So warehouses have been opening across the country, including in Tennessee. Amazon has created jobs, to be sure, but they are often part-time (making those nasty health benefits a non-factor) and barely minimum wage. The company has made news with their warehouses, but it hasn't always been about job creation. In Pennsylvania, employees were forced to work in extreme summer heat with any air conditioning, and you have no doubt been following Amazon's labor troubles in Germany. On top of all this, your Justice Department handed Amazon a monopoly on e-books with its recent ruling, assuring that independent bookstores will be unable to compete with e-books being sold as a loss leader to attract new Amazon customers. Ironically, while consumers will see lower prices, they will also see many fewer e-books published in the future. When Amazon decides not to lose money on the products, it will force e-book publishers to offer better terms. Given the already low margins, the response will be to simply not publish nearly as many titles. You'll be able to buy the newest book by Dan Brown, just not anything by the next Dan Brown. Your appearance at the Amazon warehouse in Chattanooga sends a clear signal to small independent businesses that our value as job creators and community linchpins is not as important as an arrogant chain behemoth's contributions to states' monetary shortfalls and creation of thousands more minimum wage, benefit-poor jobs. We will continue to do what we do best as locally owned businesses--offer knowledge and service to our customers, create and support community growth and activity, make every effort to provide employees with fair wages and conducive working conditions. And some of us will continue to grow and employ new workers, as small business has always done, even with the Amazons of the world being excused for past transgressions and rewarded for predatory business practices. We are disappointed that you feel Amazon deserves your attention and endorsement (even if implied). We hope you will carefully consider the message you are sending with such an appearance and perhaps re-think that message in the future. As a voter who cast her vote for you twice, and attended your first inauguration in 2009, I am writing to express my concern about your example of Amazon as a job creator. You should know that their undercutting price tactics and ability to conduct business without the tax responsibilities of all other small businesses has done irreparable damage to independent retailers across the land. For you to stand in front of their warehouse that is responsible for the loss of jobs and income is truly unconscionable. I am a small business owner, and just opened an independent community bookstore in downtown Santa Barbara, Calif. We are job creators, giving nine people employment. Our money stays in the community, we pay local, state and federal taxes, we serve our community. Amazon does NOT. 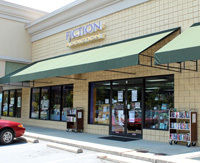 One year after relocating her Greenville, S.C., bookstore for the third time, Jill Hendrix, owner of Fiction Addiction, told GSA Business that she has benefited from a better location with more space and business is good. "We are up from last year so things are going fine," she said, noting that new turn lanes around Haywood Road have improved traffic flow, and local residents know how to find the store. "It's pretty convenient for them.... The only downside to this location is the Barnes & Noble right across the road." Crime writer Leighton Gage died last Saturday. Soho Press senior editor Juliet Grames called his work "quite unlike anything else being written or published, and time will only prove its mettle," and praised him as "a backbone of the crime fiction community as well as the Soho Crime family." He was 71. Image of the Day: Happy 90th Birthday, Ashley Bryan! 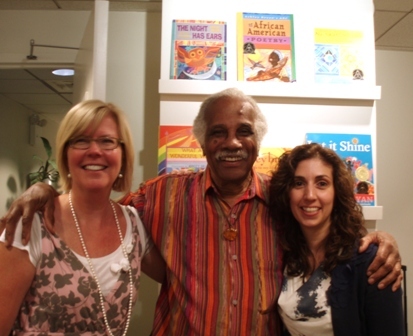 Last week, a host of librarians, booksellers and Atheneum/Simon & Schuster colleagues--as well as fellow citizens of Cranberry Island, Maine, where the author-artist makes his home--gathered to celebrate Ashley Bryan's 90th birthday. He read from his upcoming book, Can't Scare Me! (Atheneum/S&S), and the audience chanted along to the refrain. Here Bryan is flanked by his editor, Caitlyn Dlouhy (l.) and Michelle Fadlalla, director of education and library marketing. "Bookstores are in abundance" in Lexington, Ky., SurfKY reported, highlighting the "different atmosphere and different price points" available at Joseph-Beth Booksellers, Half Price Books and the Morris Book Shop. "We pride ourselves in carrying a lot of Kentucky generated goods, from books to magazines and newspapers to products that are uniquely Kentucky," said Brooke Raby, marketing manager for Joseph-Beth's Lexington location.... What we hear constantly is that people who live here have been coming to Joseph-Beth for a really long time, but what they always say is that anytime anybody comes in town to visit us, the first thing we do is take them to Joseph-Beth." Hap Houlihan, manager at the Morris Book Shop, said, "We're just a smallish, general interest bookstore sort of harkening back to earlier decades when this was sort of the norm before the big book superstores popped up. 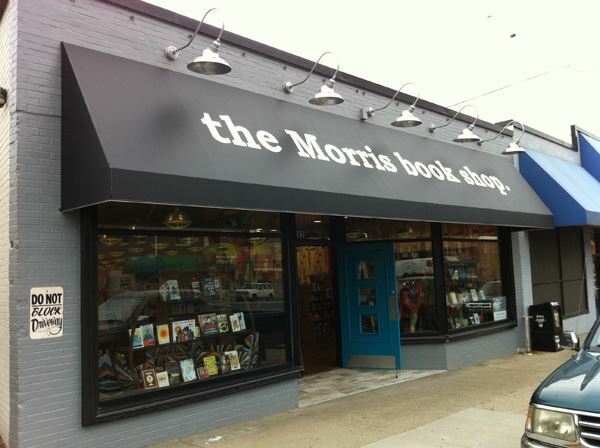 We have sort of historical roots in the fact that my uncle ran the original Morris Book Shop.... This is sort of the second reincarnation of the store. It's based on the same principles of staying relatively small, but still trying to have everything that people may want, and special ordering anything we didn't guess right on." Houlihan also observed that "all bookstores definitely have the same core mission and that's just to put good books in the hands of avid readers." 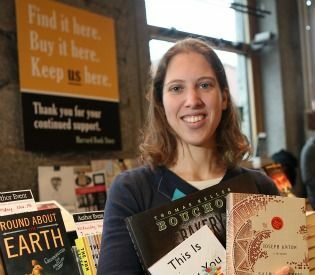 Rachel Cass has become head buyer at Harvard Book Store, Cambridge, Mass., replacing Megan Sullivan, who is becoming an assistant editor at America's Test Kitchen. Cass joined the store as a bookseller eight years ago, then was promoted to floor supervisor and marketing assistant and has been marketing manager for several years. The store is now looking for a new marketing manager; for information, contact general manager Carole Horne at chorne@harvard.com. Havana Lost by Libby Fischer Hellmann (Red Herrings Press). Tomorrow on NPR's Diane Rehm Show: readers review Woman at Point Zero by Nawal El Saadawi (Zed, $14.95, 9781842778739). Tomorrow night on the Colbert Report: Emily Matchar, author of Homeward Bound: Why Women Are Embracing the New Domesticity (Simon & Schuster, $26, 9781451665444). Five images have been released from the fourth season of Downton Abbey. "United in grief?" Buzzfeed asked. "Poor Mary and Branson both lost their significant others, Matthew and Sybil, during Season 3 of Downton Abbey. Now both single parents, they'll have to raise their young children on their own. Oh, and with the help of a fleet of servants." Margaret Atwood "is set to finally see a 15-year project realized," the Independent reported: City Opera Vancouver has revealed that the author's first commissioned opera, Pauline, will hit the stage next May, with mezzo-soprano Judith Forst in the title role. Atwood began writing the libretto "about the extraordinary life of Canadian writer, poet and actress Pauline Johnson as long ago as 1999 but the work failed to see the light of day." The winners will be honored at NEIBA's Awards Luncheon Sunday, October 6, during its Fall Conference in Providence, R.I.
Seventy-five years ago, Daphne du Maurier wrote Rebecca, a gothic novel destined to stand the test of time. Cassandra King's Moonrise is an homage to du Maurier's novel, using the same atmospheric tension, presences that may or may not be there and characters whose motivations are not what they seem. But King has also modernized the tale, adding characters both complex and intense. The Blue Ridge Mountains of Highlands, N.C., provide a getaway destination for wealthy Atlantans and other Southerners to escape the heat. Moonrise is a dreamy Victorian showplace nestled in this peaceful, majestic redoubt, its beautiful garden filled with white flowers that bloom at night. At least, that is what it used to be. Now, a year after the death of Rosalyn, mistress of the mansion, the garden is neglected and forlorn. But Rosalyn's widower, Emmet, has just arrived for the summer with his new wife, Helen, and his oldest friends are gathering to have a look at "The Bride," as one insists upon calling her. Tansy and Kit, mean and waspish as any bullying teen-age girls could ever dream of being, set about to make life miserable for Helen. They are rude, dismissive and just plain nasty. (It is a weakness in the novel that a 45-year-old woman would allow herself to be treated so shabbily.) Myna, a prize-winning poet, spends most of her time in the groves of academe; she believes the whole Highlands scene is beneath her and views it with contempt. Rounding out the cast is Annie, Emmet's daughter. She and Kit are very close, which works against Helen and Annie making a connection. Shelf Talker: A mansion in the mountains whose mistress dies mysteriously and a widower who remarries too soon for his disapproving friends are the foundation of a Southern gothic inspired by the classic Rebecca.